In modern hyper-mediated urban environments, public art becomes an inseparable part of the multiplicity of meanings generated by citizens with regards to their city, their country and each other. What meanings can public art convey after a protest in a mediated city? And how do social media users capture and reflect on these visual artefacts? This article focuses on the urban murals that appeared in Kyiv, the Ukrainian capital in the post-Euromaidan period (spring 2014 – present day). The creation of murals began as a spontaneous urban practice, but post-protest, morphed into a concerted effort to populate blank walls of decaying apartment blocks around cities with meaningful art, reflecting on the turbulent political, social and cultural changes in the country. The article considers how this mediated public art form resonates with the networked post-protest publics through the affordances of Instagram and explores the different kinds of meanings networked publics in and around the post-protest city can produce. 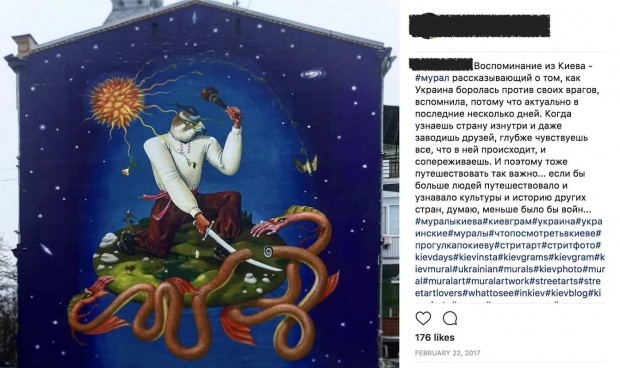 It focuses on how the mediation of the murals on Instagram might reflect or frame the meanings embedded in the murals themselves and how these themes might fit into the broader metaphorical narrative of rebirth and regeneration in the post-Euromaidan city of Kyiv. “The city finds its own use for things”. The Euromaidan protest in the fall of 2013-winter of 2014 sprung up around the idea of Ukraine as a pro-European democracy with close ties to its Western European allies. Initiated by the sudden refusal of then-President Victor Yanukovych to sign an association agreement with the EU, the protest movement grew to encompass other claims and grievances, including access to basic human rights and dignity, opposition to state corruption, and police brutality. Though protesters came from all walks of life, protest action was concentrated in urban areas and relied heavily on digital networks for coordination and daily activities. In terms of protest messages and expression, the use of urban space for protest claims was closely tied to social media use to disseminate, popularize and record visual and textual expressions of dissent. The urban public art scene exploded with new and repurposed signs, symbols and slogans. Many art objects, including posters, graffiti, stickers, digital art, were created, circulated and re-interpreted by protest participants and observers (Lishchyns’ka 2015). As in any modern urban environment, such production and consumption of art was heavily mediated through online platforms – in fact, mediation was often an intrinsic part of the artistic objects themselves, imbuing them with additional weight and significance. Public art, in other words, became an inseparable part of the multiplicity of meanings made by protest participants with regards to the momentous events and their role in them. What meanings can public art convey in the aftermath of a protest in a mediated city? And how do social media users capture and reflect on these visual artefacts? Can we say that the networked publics in and around the city use public art to reflect and make meaning of the post-protest reality? This article focuses on the urban murals that started blossoming on the walls of multiple buildings in Kyiv, the Ukrainian capital, and other Ukrainian cities, in the post-Euromaidan period (spring 2014 – present day). The creation of murals began as a spontaneous urban practice, but post-protest, morphed into a concerted effort to populate blank walls of decaying apartment blocks around cities with meaningful art, reflecting on the turbulent political, social and cultural changes in the country. The mural movement grew to encompass a slew of international artists and drew worldwide fascination, becoming one of Kyiv’s – and Ukraine’s – main attractions from the “post-protest” period. 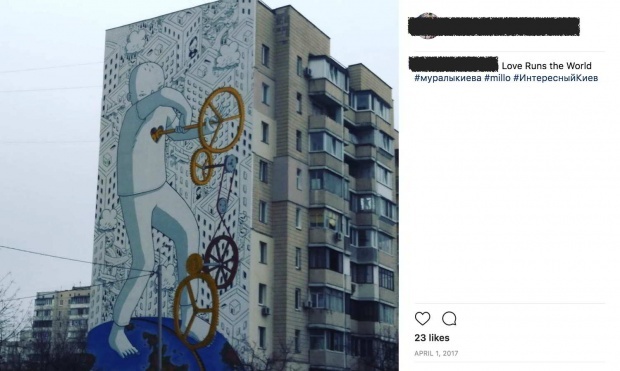 The creation of the murals has been broadly covered in Ukrainian media (e.g., Kuryshko 2015; DreamKyiv 2015; Afisha 2016; Bigmir 2016), and there is an ongoing effort to document the locations of the murals using an interactive online map (Kyivmural 2017). 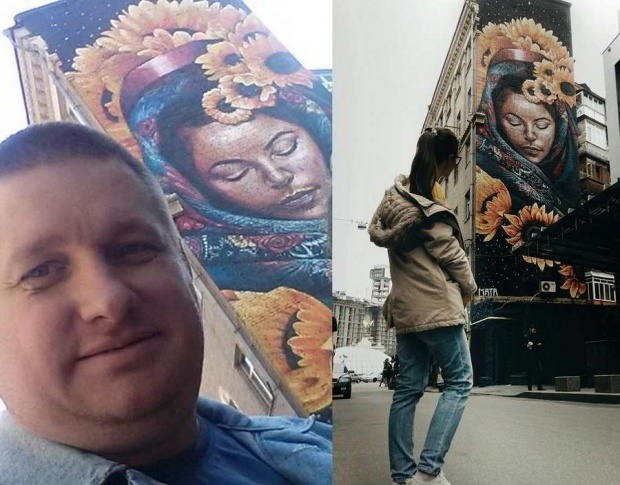 The mass proliferation of monumental murals on the walls of buildings in Kyiv occurred in two phases, orchestrated by local and international artists. The first phase, City Art, lasted from May to December 2015 (though a number of post-protest murals appeared earlier). This phase’s main goal was to refresh and transform the historic centre of the Ukrainian capital, and both Ukrainian and international artists worked to create around 30 murals. The second phase, Art United Us, started in March 2016, and is ongoing, with plans to create between 100 and 200 new murals (Afisha 2016). This phase has a more pointed focus on peacebuilding and conflict resolution (Art United Us 2017), echoing the developments in Kyiv and Ukraine, as society has turned from reflecting on the protest period to dealing with the armed conflict in eastern Ukraine instigated and supported by Russian forces. Throughout both phases of the mural creation, mural locations were negotiated with local authorities and residents through public meetings and consultations, and, though artists proposed their own themes and designs (Bigmir 2016), organisers and local residents had the final say in whether a mural would be painted on a particular wall and what it would look like. In this article I consider how the physically present public art of these murals, mediated online, resonates with the networked post-protest publics through the affordances of Instagram and explores the different kinds of meanings networked publics in and around the post-protest city can generate by engaging with the murals through social media. It focuses on how the mediation of the murals on Instagram might reflect or frame the meanings embedded in the murals themselves and how these distinct themes (Sharp et al. 2005) might fit into the broader metaphorical narrative of rebirth and regeneration in post-Euromaidan Ukraine. The article examines the visual content and themes of the murals themselves (as experienced by me in person during on-site observation or via mediated means), the mediated images of the murals on Instagram, as well as the affective expressions and contextual information, such as hashtags and other text, attached to these images in Instagram posts. Undertaking a semiotic visual analysis (Kress & van Leeuwen 1996; Jewitt & Oyama 2001) of a sample of relevant Instagram posts about the murals, the study catalogues the representational resources of the images, and categorises them in conceptual and narrative terms. It considers the symbolic and metaphorical structures of the murals themselves as visual materials, but also regards the way the murals are mediated through Instagram and the narrative and interactive structures that emerge in the process of this mediation. The findings stemming from this diverse collection of image-based affective expressions present an interesting case for scholars of mediated urban environments and contribute to the field of knowledge about how urban denizens engage with public art and the ideas it seeks to express in hyper-mediated city environments. Importantly for the Western-dominated field of social media research, this study deals with a case from Eastern Europe, enriching scholarly understanding of how platforms like Instagram are used by citizens of non-English speaking countries and environments where social media may serve as alternative spaces of public appearance, deliberation and meaning-making. In the article I draw on danah boyd’s definition of networked publics as the imagined collectives of individuals “restructured by networked technologies” (boyd 2010, 39) with the understanding that these publics are also embedded into the material spaces and geographies of the city. I complement this view with Zizi Papacharissi’s conceptualisation of the affective or highly emotional dimension of networked storytelling (Papacharissi 2016). If, as boyd argues, networked publics emerge as both spaces constructed by digital networks and as imagined communities of individuals collectively engaging in technologically mediated practices (boyd 2010), then how do people who form such networked publics engage not only with the digital platform infrastructures, but also with the symbolism and metaphors of mediated public art? And what meanings and representations of the post-protest city emerge from their collective experiencing of these artefacts through the use of networked technologies? Using the post-Euromaidan urban murals and their mediated representations on Instagram as a case study, I explore these entanglements between the concepts of networked publics, visual semiotics and affective intertextual meaning-making to discover how urban denizens orbiting in highly mediated spaces are able to make and re-make the meaning of public art and the post-protest reality it represents. As an urban art form, murals are generally considered less “illicit” than graffiti, as they tend to get the public’s and sometimes even the authorities’ blessing. Yet they also manage to capture the “hopes and fears, struggles and aspirations” of the communities which create and house them (Rolston 1992, Cockcroft & Barnet-Sánchez 1993, Golden et al. 2002). This potential to serve as vehicles and vessels of interpretive and meaning-making work for the public is especially evident in urban environments where murals emerge in reaction to instances of injustice, tragedy, violence and protest (see e.g. Rolston 1992 on murals in Northern Ireland). As examples of street art, murals are inscribed into the physical public space and thus are closely linked to people’s consumption and prosumption of such space. In fact, as they are embedded into the canvas of urban spaces, there is a certain inevitability to them being publicly beheld by urbanites. At the same time, this inescapable publicness of murals as street art (Carmona & Tiesdell 2007), when mediated, also allows for a contemporaneous, interactive agency (Visconti et al. 2010), both on the part of the artists and on the part of the urban denizens. Extending Hirschman’s (1983) discussion of artistic agency, we can argue that in multiply mediated urban public spaces, both the artists and the dwellers consuming and remediating the art can “express their subjective conceptions of beauty, emotion or some other aesthetic ideal” and simultaneously “formulate beliefs about the nature of reality and values regarding desirable states of reality” (Hirschman 1983, 46). In the contemporary, spatially hybrid cities (Ridell & Zeller 2013), public space is at once multimodal and relational, so public art is not only created to be looked at and interpreted by passers-by, but is also, together with the space it inhabits, constantly reproduced in human activities and interactions (Lefebvre 1991). This relationality, in turn, not only enables the (re)production of public art as signs and symbols, but also allows for the reimagining of the meanings behind the artistic artefacts (the signifieds behind the signifiers) and for the retelling of these imaginaries in multiple ways as they are remediated across urban networks, both digital and physical. The mediation and representation of urban spaces, and public urban art in particular, through visual social media such as Instagram has become an integral part of everyday urban existence. The practices of people that form networked publics around engagements with urban public art are necessarily inscribed not only into physical spaces of the city, but also into the networked spaces of social media platforms. boyd (2010) suggests that the latter formations are imagined collectives of people restructured by the platforms’ affordances for making content and conversations more persistent, highly replicable (text and images easily copied and shared), scalable (increasing potential visibility of text and images) and searchable. Importantly, such affordances of networked spaces lead to collapsed social contexts and the overall blurring of public and private in online discourse. This personalisation of public discourse, especially when it revolves around matters of political or social import, brings to the fore the emerging deformalisation of political debate and the role of individual reflections, emotions (affect) and opinions. Such ‘everyday’ practices allow citizens to inscribe the political within the personal (Highfield 2016) and grant them the ability to participate in and contribute to various aspects of political life in a public, yet highly individualised and often distinctly affective context provided by the digital networks and the hybrid urban spaces they wrap around. At the same time that our mediated practices of being in urban space become increasingly visually mediated and media-rich, precipitated by what Gibbs et al. (2015) call a visual turn in social media, certain ritualised uses of social media platforms emerge. Highfield defines these ritualised practices as standardised and recurring social media behaviours shaped by both the affordances of platforms and the norms and cultures around them (Highfield 2016, 41). Each of these platforms possesses a unique combination of styles, grammars and logics for expression – what Gibbs et al. term the “platform vernacular” (Gibbs et al. 2015). The vernacular emerges at the intersection of platform affordances and how they are appropriated and performed by platform users. Instagram, specifically, allows image sharing in a seamless, casual way, yet offers a range of features (such as filters or hashtags) that turn shared images into discursive focusing devices, offering a format for condensed expressions of creativity, political views or modalities of emotion and affect, such as admiration, anger, dissatisfaction, hope or passion. Such habitual practices of expression are also influenced by the fact that Instagram use is heavily centered around mobile devices and thus embedded in everyday relations with urban public spaces. This allows social media users to focus attention on particular aspects of their urban environment, be it cultural, artistic or socio-political ones, while also fostering a personal connection with the spaces on an emotional or affective level. Papacharissi (2015), complementing boyd’s view of networked publics, argues that digital networked media are especially adept at serving as conduits for affective expression in moments of social change, inviting users to feel their place in momentous historical events and to develop meaning from these events, even if they were experienced indirectly. 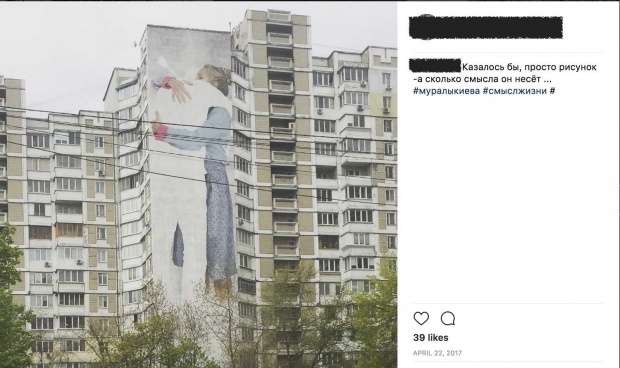 In the case of sharing Instagram images of city murals, users are able to draw attention to a particular piece of public art, but also to create certain resonance around the meaning of the piece as interpreted by its beholder. In this way, urban dwellers can engage in ritualised social media practices by adding affective and narrative context with every personal post about public art and thereby contribute to a growing canvas of intertwined individual experiences, constantly shaping and redefining the meaning inferred from their encounters with the art. Affective publics (Papacharissi 2016) concentrated around a ritualised networked practice (such as sharing images of public art on Instagram), can potentially generate a sense of connectedness among those posting to the platform, weaving their individual experiences into a multimodal set of meanings of a shared lived event or its aftermath. By incorporating the individual affective reactions to and representations of events, networked social media thus permit speculative meaning-making of uncertain situations through affective attunement (Papacharissi 2015). Focused around a particular ritualised practice in hybrid urban spaces, such affective publics could be instrumental in shaping a relational network of spatial imaginaries from which alternative futures of the post-protest city might emerge. A horizontalised, networked, spatially hybrid environment that allows for a multiplicity of voices, emotions and interpretations harkens back to Michel de Certeau’s vision of the city being written “from down below” by the ordinary visions of its urban denizens (de Certeau 1984). Especially in networked environments that offer more ambient and casual ways of reclaiming political and civic agency, emotion and affect emerge as key to informing political transformation and social change (Peltola et al. 2017). My choice of Instagram as a platform for examining the mediated practices of urban denizens around public art was informed by the fact that, unlike Facebook and Twitter, platforms that were originally text-driven, Instagram (founded in 2010) was devised as a primarily visual medium and allows for a casual capture of everyday experiences in photographic form, while also providing a space for textual or narrative content. Instagram is also becoming increasingly popular online, with the platform reporting 800 million monthly users and 500 million daily users as of September 2017 (Etherington 2017). In Ukraine in particular, the number of Instagram users has seen rapid growth and rose from 3.8 million users in April 2017 to 5.6 million users in June 2017 alone (Dmytrenko 2017). Leaver and Highfield (2016) note that Instagram data is also comparatively more accessible for research scholars than, for instance, that of its parent company, Facebook. Instagram as an application is also available across different mobile operation systems, potentially increasing the pool of users. In terms of related research on affective Instagram publics and the role of emotional narrativity in Instagram use, scholars have investigated sharing practices around grief and mourning (Gibbs et al. 2015; Leaver & Highfield 2016) and around specific communities (e.g., Ging & Garvey’s 2017 study of the pro-ana Instagram posts). Other studies have examined how certain spaces are experienced and mediated through Instagram use, for instance, museums (Weilenmann et al. 2013) or cities in a broader sense (Hochman & Manovich 2013; Boy & Uitermark 2016). The proliferation of locative mobile media with image-capturing capabilities coupled with image-sharing platforms like Instagram results in a further hybridisation of the “experience” of urban public art, making the material, spatial and digital aspects of it inseparable. MacDowall and de Souza (2017) argue that in fact, there is a close relationship between the architecture and vernacular of Instagram as a platform and the production and consumption of urban street art. This is evidenced by many graffiti and street artists incorporating Instagram into their everyday practices and using it to document, share and distribute their work. The experience of consuming street art is also changed by Instagram as part of our highly mediated interaction with hybrid urban spaces. In this respect, the image-centric nature of Instagram (while also availing of its capabilities for intertextuality) offers a productive way to examine how urban denizens engage with public art in the city and how they use the affordances of Instagram to produce image-based reflections on the art and the meanings behind it. I collected the data for this case study on Instagram from January to April 2017, focusing on three hashtags that were most commonly used to accompany photos of and mark people’s experiences of murals in Kyiv after the spring of 2014 (the end of the protests). These were #муралыкиева (Russian), #мураликиєва (Ukrainian), and #muralkiev (English). Ukraine, and Kyiv in particular, has a multi-lingual tradition colouring its social media practices, so it was important to capture these rituals in their original forms (e.g., a number of Instagram posts use more than one of the above hashtags, ostensibly to increase visibility, or use them in conjunction with other hashtags). The use of the hashtags also could be seen as indicating the overtly public nature of the posts, and all collected posts were accessed through the publicly accessible desktop Instagram view which does not require registration. Despite these operational definitions of publicity, social media users often have varying degrees of privacy expectations, especially when sharing personal content (Leaver & Highfield 2016). Therefore, in this study I only present selected samples of shared visual content, anonymise the screen captures of Instagram posts, and focus heavily on textual description of the images. After cross-comparison and stripping out the duplicates (images that were the same unique posts and contained more than one designated hashtag), the total number of posts for analysis was reduced to 1,817 URLs. I then analysed the Instagram posts employing visual and textual semiotic analysis in terms of the images they contained and the additional textual content that accompanied them, such as hashtags and user-generated captions. I did not analyse the comments from other users under each Instagram post as they were beyond the scope of this project. The obvious limitation of this sampling method is that focusing on three hashtags does not allow to capture the complete dataset of mural-related Instagram posts (a common issue in Instagram-based research, see e.g., Ging & Garvey 2017; Leaver & Highfield 2016). Certainly, many photos of murals are not marked with these hashtags yet selecting the most commonly used popular ones allows me to productively focus the sampling strategy and capture a non-representative, yet significant subset of relevant data from the social media platform. In what follows, I analyse Instagram posts by using a social semiotic approach to glean how the semiotic resources of Instagram posts are used for interpretation and intertextual connection (Jewitt & Oyama 2001). This analysis helps gauge how Instagram is used as a visual communication platform to remediate urban murals and how those image-based practices can be understood in the context of post-protest meaning-making and affective expression. In their approach to social semiotic visual analysis, Kress and van Leeuwen (1996) identify three kinds of meaning-related work that images may do: representational (i.e., an image represents the world or part of it), interactive (i.e., an image plays a part in an interaction with those capturing or viewing it) and compositional (i.e., an image constitutes a kind of recognisable textual element). In each of these aspects, the semiotic resources analysed are grounded in particular social, historic and cultural contexts and also shaped by people’s own meaning-making efforts when consuming visual messages. Of particular interest here are the representational semiotic resources, which Kress and van Leeuwen separate into conceptual and narrative structures. Conceptual structures can symbolically define, characterise or classify people, places or things in the images. In the case of urban murals, reading the images of murals for symbolic or metaphorical definitions of key themes is an important part of the overall analysis of their Instagram-based remediation. On the other hand, narrative structures are indicative of relationships and actions between subjects or objects in the image and can often be seen through vectors of action or reaction in visual materials that might be transactive or non-transactive (Jewitt & Oyama 2001). These can be compounded by analysing the interactive semiotic resources in images, such as distance or point of view, to glean additional meaning from an Instagram photo. The first stage of analysis was aimed at exploring the imagery of the murals themselves. I categorised the mural images from the Instagram posts with regard to their symbolic or metaphorical conceptual structures, using mutually exclusive categories as they emerged from a preliminary overview of the post sample. These categories were grounded in the social, historic and cultural contexts of post-protest Ukrainian social and urban life and were to some extent informed by additional knowledge about the murals gleaned from media coverage (Kuryshko 2015; DreamKyiv 2015; Afisha 2016; Bigmir 2016), such as information about the artists and interviews with the creators and curators. This contextual categorisation was largely an inductive process and resulted in a list of broad symbolic and metaphorical themes. I discuss these in detail in the findings. At the second stage of analysis, I shifted the focus to examining the narrative structures with regard to users’ relational and participatory practices in urban space evident in the images. Here, visual analysis centred on the presence or absence of the city dwellers in the photos of the murals they captured, their visual relationship with the murals, their reactions to the murals, and the various angles of the photos suggesting different points of view and distances with regards to the public art in urban spaces. Additional intertextual analysis focused on the presence of user-provided context such as additional hashtags and personal comments about the art or related to it. The findings of this stage of the analysis indicate how people use the affordances of Instagram to connect mediated public art (murals) to their own points of view and affective standpoints, allowing for a multiplicity of visual and intertextual meanings of the post-protest city. In the following, I will summarise the findings of both stages of analysis in separate chapters, with a greater focus on the narrative structures in order to capture the role of Instagram-based mediation practices in meaning-making around public art. The visual semiotic analysis revealed a number of broad conceptual themes encompassing most of the murals created during the post-Euromaidan period. The key symbolic categories that emerged were: Ukrainian history and heritage; Kyiv’s urban history, myths and stories; protest, revolution and national identity; new heroes of post-Euromaidan Ukraine. A number of the murals also involved the more metaphorical themes of change, rebirth and transformation; freedom and peace; the more emotional themes of hope and love; and abstract art (uncategorised or other). To some extent, these reflect the affective themes of hope, struggle and aspiration encountered by other scholars who have studied murals as public art in various contexts (Rolston 1992, Cockcroft & Barnet-Sánchez 1993, Golden et al. 2002), but a few of the categories are specific to the post-Euromaidan context. I briefly outline and explain the categories below, beginning with the more general themes and then focussing on those related to the post-protest context. Ukrainian history and heritage (6%, 109 posts): Murals in this category usually depict figures that played important roles in Ukrainian history (e.g., Ukraine’s first president Mykhaylo Hrushevsky) or its cultural heritage (e.g., the writer and poet Lesya Ukrainka). A recurring element in this category is the symbolic presence of traditional Ukrainian dress, ornaments, patterns and other symbols of Ukrainian historical and cultural legacy. Kyiv as urban history, stories, artefacts (5%, 91 posts): This category contains murals that reflect particular elements of Kyiv’s own, more intimate urban lore. Examples in this category include an image of Archangel Michael (traditionally, the guardian angel of Kyiv city – see Figure 1) and a mural depicting a group of black ravens (a reference to a cage with live ravens hidden in a small yard in old town Kyiv, a closely guarded urban “secret” location). These elements or moments of local lore serve as a kind of visual synecdoche for the city as a whole, while pinpointing their own sentimental or emotional value. Image 1. 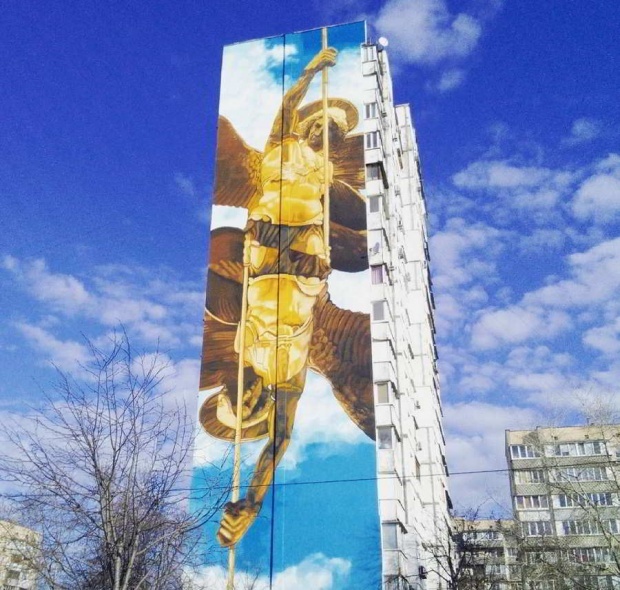 Mural, a depiction of Archangel Michael, guardian angel of Kyiv city, in a residential neighbourhood. Photo from Instagram. Abstract art or other (9%, 163 posts): This category contains largely uncategorisable murals that don’t fit into a particular theme (e.g., an elephant hanging from a cluster of colourful balloons). Protest, revolution, national identity (39%, 709 posts): While the first three categories are fairly direct in their symbolism, this category is likely the most metaphor-rich, as the art in it seeks to make sense of the tumultuous events of the fairly recent protests and their impact on national – and urban – identity. This is also one of the most densely populated categories in the dataset. Examples of metaphors and allegories in this category include a fairytale setting depicting a mythical hero battling a snake (struggle); protesters in animal masks, one of them carrying a Ukrainian flag, in a standoff with equally masked thugs (Figure 2); a ballet dancer balancing on a bomb with a lit fuse (revolution); a girl in national dress in a field of sunflowers under a blue sky (yellow and blue are the colours of the Ukrainian flag and are often used to signify national identity). This category also includes more recent images commenting on ongoing violence and loss of life in Ukraine, as exemplified by a mural depicting a woman hugging a blank shape of a man with an arrow through his back. Image 2. 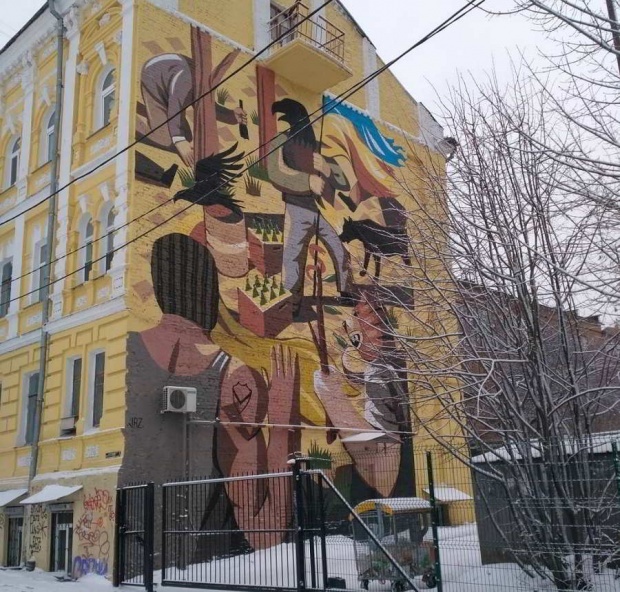 Mural, a metaphorical depiction of struggle between ‘good’ and ‘evil’ forces in Ukraine, in a residential neighbourhood. Photo from Instagram. New heroes of post-Euromaidan Ukraine (5%, 91 posts): This category is fairly straightforward, capturing individuals who were prominent during the Euromaidan protests or became symbols of the post-protest environment. Examples here include a portrait of Serhiy Nigoyan (Figure 3), a young protester who was the first victim of the anti-protester violence and died aged only 21; and a mural with Anna Rizatdinova, a female athlete from Crimea (an autonomous republic within Ukraine that was occupied by Russia after Euromaidan). Image 3. 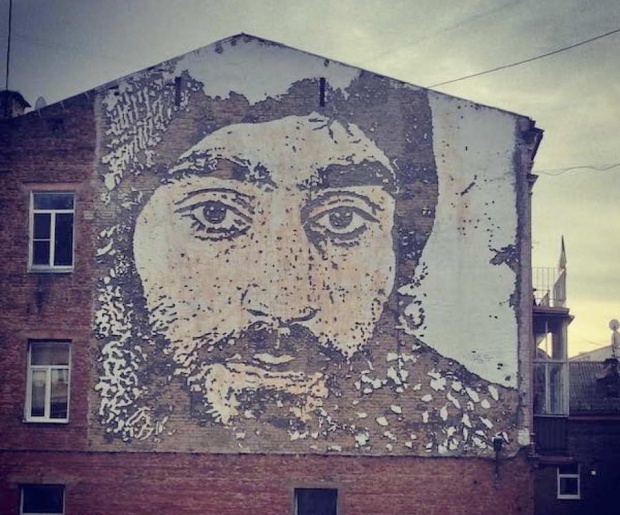 Mural, a portrait of Euromaidan protester Serhiy Nigoyan in downtown Kyiv. Photo by Tetyana Lokot. Change and transformation (19%, 345 posts): Another more metaphorical category of murals depicting various allegories for change and transformation, including a runner breaking through the finish line and simultaneously breaking through their own skin (Figure 4) and a man crossing a river while holding onto a deer’s horns. Image 4. Mural, a runner breaking through the finish line, in a residential neighbourhood. Photo from Instagram. Freedom, peace, hope and love (17%, 309 posts): There are yet more metaphors in murals in this category, ranging from a person with a key through their heart connected to a series of gears (“love runs the world’) to a proliferation of murals containing images of birds (a common symbol of freedom or peace), sometimes with literal additions of text (e.g., an image of storks in a nest and “Peace to Ukraine” under them). The fact that the thematic category dealing with protest, revolution and national identity, and the ones depicting themes of change, transformation, peace, hope and freedom were the most numerous is in line with the general history of the mural movement and the explicit desire to address these themes in the public art spaces. It is also in line with the aims of the post-Euromaidan mural creation movement to populate public urban spaces with fresh ideas and meanings in the wake of momentous social events. At the same time, the distribution of themes is to some extent informed and shaped by the choices made by individual city dwellers on Instagram as they decide which murals to capture, share and comment upon. Though not a representative sample, the prevalence of mural images with these specific themes among the Instagram-based networked publics indicates a certain preoccupation with and desire to join the public post-protest discourse about social change, urban transformation and identity renegotiation precipitated by the events of Euromaidan and their aftermath. Further visual semiotic analysis was aimed more specifically at how the mural images were mediated and represented through the means of Instagram. This analysis revealed some of the key narrative processes and relational practices around social media users’ interactions with murals as a form of monumental public art. In the Instagram images, users captured the urban spaces and the public art inscribed within them, and themselves as interactive participants (engaging in the action). The urban spaces and art interchangeably served as background – what Kress and van Leeuwen (1996) call “locative circumstances” – and as a more central, foregrounded participant in the image. Self-inscription and juxtaposition of the self and the image in the mural occurred in about one tenth of the posts (198 cases out of 1,817), most often exemplified by the selfie format, with the user’s (users’) face(s) close-up and the mural in the background or acting as a kind of frame (see Figure 5 for examples). This self-inscribing in the Instagram posts was overwhelmingly meant to convey reaction (of the person inscribed to the art), but was predominantly non-transactive, in that no return action was expected from the mural as an inanimate, if meaningful object. In some cases though, this more intimate point of view (suggested by a close-up of the user inserting themselves into the hybrid art space) was replaced by a more distant one, picturing the urban citizen in proportion to the monumental art, to indicate the scale of the space occupied by the artistic creation. In some other cases, users inserted themselves into the artistic landscape more directly by posing as if in dialogue with the mural or as one of its elements. Self-insertion or more intimate point-of-view practices can serve as indicators of subjectivity and personalisation (Gibbs et al. 2015) of our visual experiences, especially with regard to how we receive and remediate public art in urban spaces. Such self-insertion and “drawing closer” to the murals or “gazing upward” at them can perhaps indicate the “affective attunement” that Papacharissi (2015) describes when discussing how social networked media allow us to inscribe ourselves into historical events through structures of feeling and affect shared with others on the network, even if we ourselves were not physically present at a given event at the time it occurred. In the case of post-Euromaidan murals in particular, such visual affective insertion may serve to integrate the feelings and experiences of Instagram users about the events of the protest and its aftermath into broader structures of meaning and emotion generated by the creation of the murals and their collective representation on Instagram. Image 5. Caption: Examples of different self-inscription in images with the same mural. Photos from Instagram. More often than not, however, the Instagram images simply depicted the wall or building hosting the mural, without any interactive participants involved (69% or 1,254 posts). In these cases, users were capturing the art itself or as framed by the urban space it was inscribed into, offering various possibilities to interpret the city as background to the mural; the mural as background blended with the rest of the urban space; or the mural as foregrounded (cropped) exclusively without the urban background. The remaining posts (365 images or about 20% of the total sample) either contained other objects (e.g., coffee cups) or depicted the mural as a smaller part of a larger urban landscape, again negotiating its relationship with the urban space around it by backgrounding or foregrounding the mural in the context of the city. The contextualisation in these cases occurred through the use of intertextual tools such as hashtags or short comments appended to the shared image. Though not part of the visual object per se, these hashtags and utterances are nonetheless part of the Instagram platform vernacular (Gibbs et al. 2015) and connect the shared images to broader discourses and meanings, serving as entryways to other users’ image feeds and cementing Instagram’s sociality as a visual media platform. Yang (2015) further argues that hashtags derive their narrative agency as much from their narrative form as from their contents and social context – and this is certainly true for hashtags used in conjunction with the images on Instagram. – What is it (what is in the picture): Those who captured and shared photos of murals added context to the images, explaining what they thought the mural depicted, when it was made, who created it, and providing other additional factual details. This level of verbal engagement allowed for some compositional meaning-making and interpretation, but in a very basic sense with only the lightest of framing efforts. For instance, Figure 6 shows a post with an image of a mural where the only added context is the original title of the mural, ‘Love Runs the World’, given to it by the artist and conveyed by the author of the Instagram post. Image 6. Image of a mural on Instagram, with user adding context by providing the original title of the mural, ‘Love Runs the World’, and the hashtags ‘Kyivmurals’, ‘millo’ (the name of the artist) and ‘InterestingKyiv’. Photo from Instagram. – What is the artistic value: In a number of posts, users debated and critically evaluated the artistic merit of a particular mural. This was done either by using specific additional hashtags (e.g., #modernart) or by offering direct commentary on the quality of the artists’ work, the choice of the theme or the appropriateness of the mural in its surrounding space. This group also accounts for a few comments that dealt with the choice of wall or building which housed the mural (in some cases, the buildings had historical value of their own). There were comments that were positive, as well as negative or neutral in terms of sentiment value. Combined with the visual representational meaning, these comments further elucidate the relational nature of urban space and public art within it, underscoring the tensions between the interactive participants and the represented art in the act of remediation online. – Why it is significant: A smaller number of posters used comments to explain the significance of a particular mural or its subject/theme, adding to the salience and value of the image itself. This is a deeper level of commentary that allows for more profound engagement with the signifier (the mural remediated in an Instagram image) and for an in-depth exercise in compositional meaning-making as it is interpreted into a signified. Comments in this group usually touched on the history behind specific images or events they signified and justified the appearance of particular murals by placing them in the context of recent events such as the Euromaidan protests, the ongoing political reforms or the simmering conflict in eastern Ukraine. Some of the comments about significance also involved discussions of the changing image of Kyiv as a ‘European capital’ and the role of the murals as public artefacts signifying these changes. Figure 7 shows one such Instagram post, where the poster analyses a mural depicting a young woman holding an open cage with one bird still inside the cage, and the other out of it. 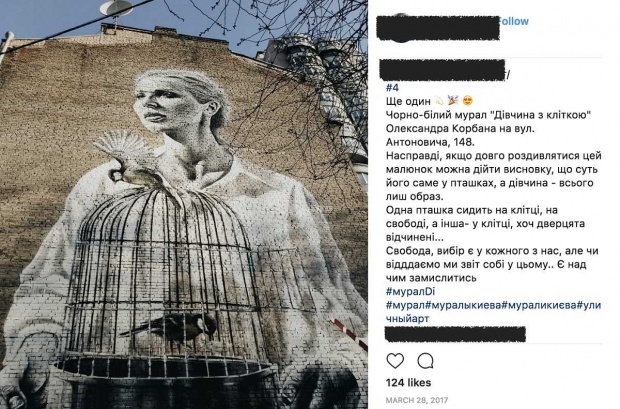 The author of the Instagram post ruminates on the meaning of the image where “the point of the mural is the birds, not the girl” and concludes that “we all have freedom and choice, but are we all conscious of having them?”. Image 7. Image of a mural on Instagram, depicting a young woman with an open bird cage and two birds. The poster reflects on the symbolism of the image and its relation to issues of personal freedom and choice. Photo from Instagram. A memory from Kyiv – a mural telling the story of how Ukraine fought against its enemies, I remembered it because it’s been timely these past few days (the post was made on February 22, the anniversary of the last days of the Euromaidan protest – TL). When you get to know the country from the inside and gain friends, you feel everything going on here much deeper and you feel empathy. Though transient and ephemeral, these bursts of affective representations of urban murals in Instagram posts, evident from the combination of image-based symbolic structures and supplementary contextual text and hashtags, arguably contribute to a networked reimagining of the city. They do so by combining the feelings, fears, hopes and aspirations ignited and represented by the public art into a networked collection of the imaginaries of “the post-protest city we want” ­– and allow the networked publics to claim the right to that city. Image 8. Image of a mural on Instagram, depicting a woman hugging a blank shape of a man with an arrow through his back, with the post author reflecting on how the image makes them feel. Photo from Instagram. Image 9. Image of a mural on Instagram, depicting a metaphorical scene of struggle. The poster reflects on the symbolism of the image and its relation to Ukraine’s struggle during the Euromaidan protest. Photo from Instagram. By analysing how murals that emerged in post-Euromaidan Kyiv were visually and verbally mediated on Instagram I explored in this article the possibilities provided by a remediation of urban art for meaningful participation in public life that exist beyond institutionalised political arenas (Visconti et al. 2010). We are talking about an urban politics that is visual, personalised and highly affective. This kind of politics is especially pertinent for non-Western contexts (such as Ukraine and other Eastern European states) where social media platforms are often used by citizens as alternative spaces of public deliberation and meaning-making, but where visual platforms such as Instagram have received significantly less scholarly attention than the dominant players such as Facebook and Twitter. The materials I examined, such as the images of the murals themselves and their intertextual depictions in Instagram posts, demonstrate how public art can engage networked publics and enable them to renegotiate symbolic representations of power, history and citizenship within the city. Beyond the initial artistic intent and the thematic and relational meanings of the murals dealing with key concerns of a post-protest society in symbolic and metaphorical terms, urban denizens employ various ritualised social media practices and avail of specific platform vernacular to further interpret and make meaning of the public art. They insert themselves and juxtapose themselves with the art in visual terms creating a variety of meaning-making structures around their reactions to the murals, their relationship with them, and their experience of them. These structures signal the users’ subjectivity with regards to public art, a personalisation of visual experience and a certain affective attunement to the state of the city and its dwellers in the aftermath of the protest events. In Instagram posts, these newly formed affective publics weave their experiences and reflections into broader structures of meaning and emotion generated by the creation of the murals and their collective experience of them on Instagram. They further engage in meaning-making practices by adding context to the murals, evaluating their artistic merit, explaining their significance, and sharing personal stories about the feelings and memories that the public art objects evoke in them. Combined, these hybridised spatial practices add layers of meaning to the public art and the spaces it inhabits, allowing for a multiplicity of affective, bottom-up post-protest meanings that contribute to the city being written “from down below” (de Certeau 1984) and include themes of rebirth, regeneration (Sharp et al. 2005) and post-conflict reconstruction and peacebuilding. This multiplicity also extends to the imaginaries of the city itself: the mural, itself a layer of meaning transposed onto a ‘blank’ canvas of a city wall, becomes a canvas where multiple personal meanings are inscribed when the murals are captured and circulated in Instagram posts. The study’s findings show how engaging with the city through mediated and remediated public art allows citizens (both participants of the protests and not) to weave their own memories, meanings, and feelings into the multiple representations of the post-protest city that are able to co-exist and entangle. The mediated set of networked images and attached textual namings and depictions emerges as both a tool and a space of public conversation about the meaning of art in cities and what it can do. While the murals themselves are a result of public negotiation, the networked imagery around them also emerges as a constant re-negotiation of personal stories and experiences. The city is refashioned and reborn after a crisis through new public art, but also through the multiple networked imaginaries that the art evokes. The rebirth, then, is also hybrid, relational and multispatial, existing in the augmented environment where physical space, bodies and digital images together with their verbal commentaries all merge. The Instagram-based affective public constructed around urban public art in the post-Euromaidan context serves as evidence that engagement with digitally mediated urban art may play a key role in re-negotiating representations of power, history and citizenship in the wake of transformative social events such as mass protests. All links verified June 3, 2018. Afisha. 2016. “Художники со всего мира нарисуют 100 новых муралов в Киеве [Artists from around the world will paint 100 new murals in Kyiv]”. http://afisha.bigmir.net/other/news/229329-Hudozhniki-so-vsego-mira-narisujut-100-novyh-muralov-v-Kieve. Art United Us. 2017. “About.” Facebook page. Accessed on April 2, 2017. https://www.facebook.com/pg/artunitedus/about/. Bigmir. 2016. “Гео Лерос: Мы не диктуем художнику, какой мурал ему рисовать [Geo Leros: We don’t dictate to the artist what kind of mural to draw]”. http://news.bigmir.net/capital/999181-Geo-Leros–My-ne-diktuem-hudozhniku–kakoj-mural-emu-risovat–. Dmytrenko, Oleg. 2017. “5.6 million Ukrainians are already using Instagram, while Facebook fell to 8.9 million.” Watcher, June 27, 2017. http://watcher.com.ua/2017/06/27/5-6-mln-ukrayintsiv-vzhe-korystuyutsya-instagram-a-facebook-prosiv-do-8-9-mln/. DreamKyiv. 2015. “Лица: Гео Лерос — о том, каково это, заниматься муралами в Киеве [Faces: Geo Leros – on what it’s like to work on murals in Kyiv]”. 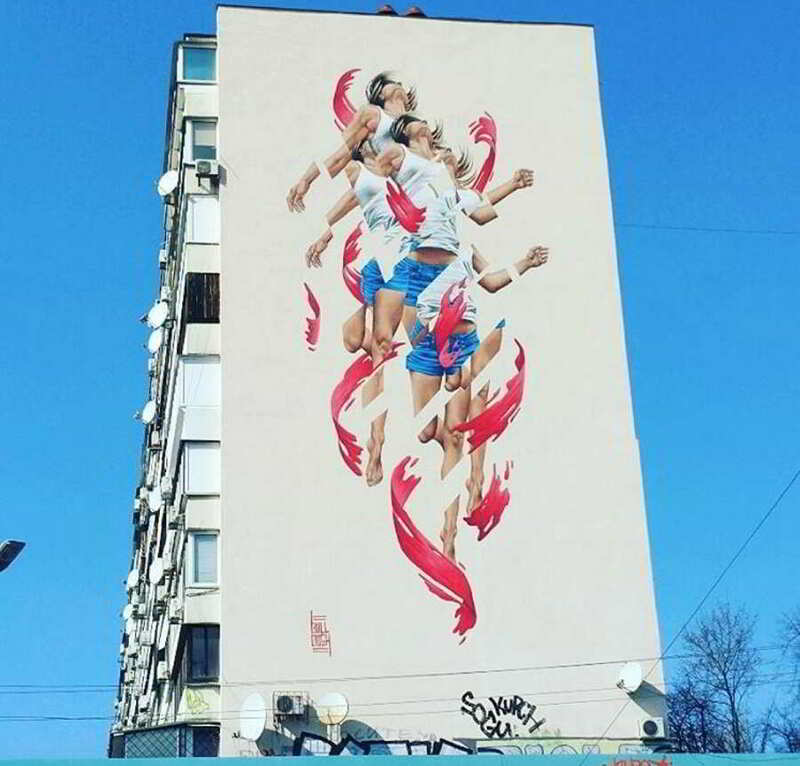 DreamKyiv, December 29, 2015. http://dreamkyiv.com/lytsa-geo-leos-o-tom-kakovo-eto-zanymatsya-muralamy-v-kyeve/. Etherington, Darrell. 2017. “Instagram now has 800 million monthly and 500 million daily active users.” TechCrunch, September 25, 2017. https://techcrunch.com/2017/09/25/instagram-now-has-800-million-monthly-and-500-million-daily-active-users/. Kyivmural. 2017. “The Murals of Kyiv”. Accessed on April 2, 2017. http://kyivmural.com/en/index. Kuryshko, Diana. 2015. “От искусства до пятен: как в Киеве воспринимают муралы [From art to spots: how murals are perceived in Kyiv]”. BBC Ukrainian, December 16, 2015. http://www.bbc.com/ukrainian/ukraine_in_russian/2015/12/151216_ru_s_mural_kyiv. Boy, John D., and Justus Uitermark. 2016. How to study the city on instagram.” PloS one 11, no. 6: e0158161. Boyd, Dana. 2010. “Social network sites as networked publics: Affordances, dynamics, and implications.” In Networked self: Identity, community, and culture on social network sites, edited by Zizi Papacharissi, 39-58. New York: Routledge. Carmona, Matthew and Steve Tiesdell, eds. 2007. Urban Design Reader. Oxford: Elsevier. Cockcroft, Eva Sperling, and Holly Barnet-Sánchez, eds. 1993. Signs from the heart: California Chicano murals. Albuquerque: UNM Press. De Certeau, Michel. 1984. The Practice of Everyday Life. Berkeley and Los Angeles: University of California Press. Gibbs, Martin, James Meese, Michael Arnold, Bjorn Nansen, and Marcus Carter. 2015. # Funeral and Instagram: Death, social media, and platform vernacular.” Information, Communication & Society 18, no. 3: 255-268. Ging, Debbie, and Sarah Garvey. 2017. ‘Written in these scars are the stories I can’t explain’: A content analysis of pro-ana and thinspiration image sharing on Instagram.” New Media & Society: 1461444816687288. Golden, Jane, Robin Rice, and Monica Yant Kinney. 2002. Philadelphia Murals and the stories they tell. Philadelphia: Temple University Press. Highfield, Tim. 2016. Social media and everyday politics. John Wiley & Sons. Hirschman, Elizabeth C. 1983. “Aesthetics, Ideologies, and the Limits of the Marketing Concept.” Journal of Marketing, 47 (Summer): 45–55. Hochman, Nadav, and Lev Manovich. 2013. Zooming into an Instagram City: Reading the local through social media.” First Monday 18, no. 7. http://firstmonday.org/ojs/index.php/fm/article/view/4711. Jewitt, Carey, and Rumiko Oyama. 2001. Visual meaning: A social semiotic approach.” In Handbook of visual analysis, edited by Theo van Leeuwen and Carey Jewett, 134–156. London: SAGE. Kress, Gunther R., and Theo Van Leeuwen. 1996. Reading images: The grammar of visual design. Psychology Press. Leaver, Tama, and Tim Highfield. 2016. Visualising the ends of identity: Pre-birth and post-death on Instagram.” Information, Communication & Society, 1–16. Lefebvre, Henri. 1991. The production of space. Vol. 142. Oxford: Blackwell. Lishchyns’ka, Olha. 2015. “Ukrainian Visual Art as an Artistic Expression: from Euromaidan to the Military Confrontation in Eastern Ukraine.” Українознавчий альманах [Ukrayinoznavchy Almanach], 18: 1–3. MacDowall, Lachlan John, and Poppy de Souza. 2017. ‘I’d Double Tap That! !’: street art, graffiti, and Instagram research.” Media, Culture & Society: 0163443717703793. Peltola, Taru, Maria Åkerman, Jarkko Bamberg, Pauliina Lehtonen, and Outi Ratamäki. 2017. Emergent publics and affects in environmental governance.” Journal of Environmental Policy & Planning: 1–13. Rolston, Bill. 1991. Politics and painting: Murals and conflict in Northern Ireland. Rutherford: Fairleigh Dickinson University Press. Papacharissi, Zizi. 2016. Affective publics and structures of storytelling: Sentiment, events and mediality.” Information, Communication & Society 19, no. 3: 307–324. Papacharissi, Zizi. 2015. Affective publics: Sentiment, technology, and politics. Oxford: Oxford University Press. Ridell, Seija, and Frauke Zeller. 2013. “Mediated urbanism: Navigating an interdisciplinary terrain.” International Communication Gazette, 75(5-6): 437–451. Sharp, Joanne, Venda Pollock, and Ronan Paddison. 2005. Just art for a just city: public art and social inclusion in urban regeneration.” Urban Studies 42, no. 5-6: 1001–1023. Visconti, Luca M., John F. Sherry Jr, Stefania Borghini, and Laurel Anderson. 2010. Street art, sweet art? Reclaiming the “public” in public place.” Journal of consumer research 37, no. 3: 511-529. Weilenmann, Alexandra, Thomas Hillman, and Beata Jungselius. 2013. Instagram at the museum: communicating the museum experience through social photo sharing.” In Proceedings of the SIGCHI conference on Human factors in computing systems, pp. 1843–1852. ACM. Yang, Guobin. 2016. Narrative agency in hashtag activism: The case of# BlackLivesMatter.” Media and Communication 4, no. 4: 13–17.